Practical tips for the urban dweller. (SPOT.ph) We’d all like to think that nothing bad happens in the Philippines. The Department of Tourism’s "It’s more fun in the Philippines" campaign is a testament to that wishful thinking. Alas, we have to admit that there are some misguided souls out there who are up to no good. That being said, we at SPOT.ph are putting out our Streetsmart Guide series to help inform and remind everyone to think on their toes and prevent being targeted by suspicious elements. 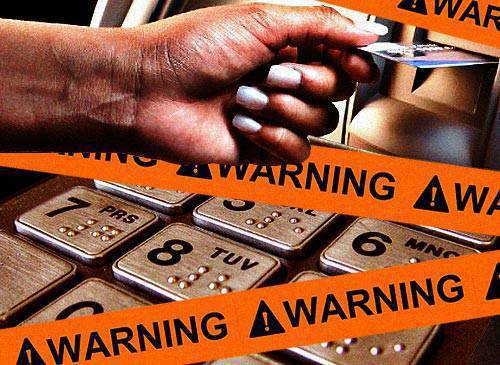 In this first installement, we’ve culled some expert advice to make sure that your Automated Teller Machine (ATM) transactions don’t get interrupted by any sort of criminal activity. It’s really more fun when you’re safe, after all. Aside from intimidating their ATM prey through the use of force or weapons, many thieves also cause confusion so you’ll let down your guard. Watch this 24 Oras video and get clued in on one of their favorite criminal routines. 1. Pick a good spot. Real estate agents say, "It’s all about location, location, location." It’s the same deal when you’re using an ATM. Avoid using ATMs that are situated in secluded areas with no visible security guards or those that are too close to the roadside. In the former, you’d be vulnerable to robbers to who could corner you while you’re making a withdrawal then easily hurt you or threaten you and, of course, eventually take your money. In the latter, a robber can just make a mad dash for your cash and then quickly blend in with the crowd. Go for ATMs situated in malls, office buildings, and other such establishments. 2. Time it right. Waiting in line is torture. Then again, it’s better to be part of the "ATM rush hour" than to make a withdrawal late at night or at the crack of dawn. Aside from the fact that those times may be robbers’ "peak hours," you’d also be in a lot of trouble if your ATM card gets stuck inside the machine. You’d have to wait a few more hours or until the next day to try and retrieve your card. You’d be pretty unlucky if your card happened to get stuck right smack in the middle of a long weekend. To be safe, withdraw cash during banking hours or, if possible, early in the week. 3. Don’t talk to strangers. As children, we were told to be wary of strangers. The rule stays the same, especially at the ATM. Remember that the devil has many disguises. Resist the urge to play Good Samaritan and leave it up to either the security guard or bank authorities to assist the person who claims to be "in an emergency." It’s better to seem like a bad person than to be robbed. You never know what kind of scam robbers will try to pull off. A U.S. public service annoucement about ATM safety. 4. Lose the stalkers. If you’re on your way to the ATM, make sure you’re not being followed. Some robbers will stalk you and then swoop in while you’re withdrawing money. One scam has a robber acting like your irate spouse. This is usually done by a man, with the woman as the target. regardless of the time or place, the man will make a ruckus. He will probably scream at you and then slap you. Once you’re temporarily out of commission, he easily takes your money and the rest of your belongings. This usually happens at ATMs that are enclosed. In this case, police suggest that you lock the ATM enclosure’s door. In case there is no lock, just move on to a better situated ATM. Bottom line: If you see anyone suspicious, run like hell. 5. Don’t leave a paper trail. First off, don’t count your money while you’re standing over the machine. When you do that, you attract potential robbers who may end up following you when you leave the ATM area. Second, rip up your transaction slip or place it in your bag after you’re done giving it a quick glance. The person who is next in line would easily be able to check your transaction slip if you happen to leave it behind. You can argue that it’s highly unlikely that the next person to use the ATM would be a criminal. But stranger things have happened. You shouldn’t be taking that chance. 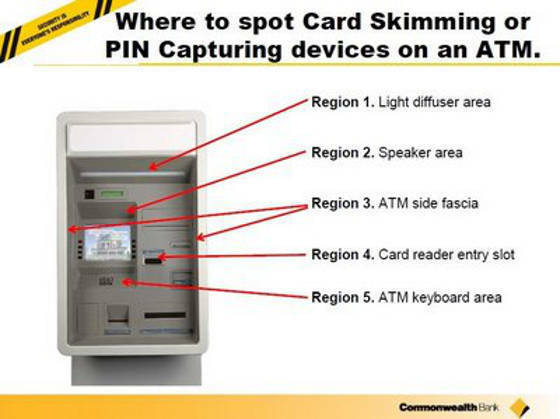 Australia’s Commonwealth Bank shares this diagram to warn ATM users against card skimming devices. 6. Keep your eyes open. Familiarize yourself with the look of the ATM machine. 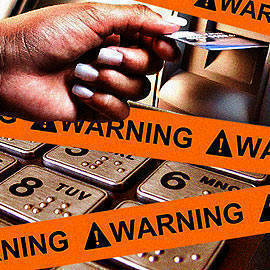 If you see anything unusual, then keep your ATM card in your wallet and alert the authorities. Check out the diagram above, provided by a bank in Australia. 7. Keep it short. There are people who hog the ATM, as they insert multiple cards and make multiple withdrawals. If you have to do more than one transaction, make sure that the line behind you isn’t piling up that much. Taking too much time at the ATM makes you an easy target. People become familiar with how you look and, obviously, they know that you’re already carrying around a lot of cash. 8. Make sure your PIN is a killer. It’s an absolute no-no to use your birthday or other easily obtainable numerical information as your ATM Personal Identification Number (PIN). Let’s say you wallet with your ATM card and ID gets taken from you. If you use your birthday as your PIN, the robbers can easily get that information from your other ID cards and then use it when they attempt to use your card. Don’t make it easy for them to rob you. <>You must watch this Philippine National Police video on ATM scams. Barring the somewhat cheesy dramatizations, it’s got very useful information about the card skimming scheme. <>9. Don’t disclose your ATM card information to anyone. Sure, you need to inform your immediate family about where you keep your money in case something happens to you. But, aside from them, you really don’t need to tell anyone else about it. As such, don’t respond to scam emails that ask for your ATM card details. You should also make sure that your ATM card statements are either sent directly to you or through the bank’s Web portal. ATM statements that are sent by snail mail can easily be taken by passers-by or other people who may have nefarious plans. <>10. Be informed. Watch the news and pay attention to your bank’s safety advisories. Criminals will keep coming up with ways to fleece you. That’s just the way it is. But you can protect yourself by knowing what they’re up to. When in doubt about any ATM-related issues, your best move would be to call your bank and speak to the person in charge.